In April 1997, a dream was born to provide equine-assisted therapeutic services in Southeast Kansas and the surrounding four-state area. 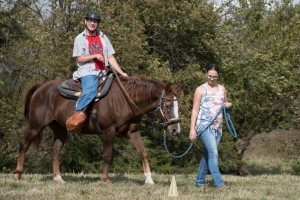 Horses of Hope Riding Center, Inc. in Baxter Springs, Kansas opened in the fall of that year and gained affiliation with the Professional Association of Therapeutic Horsemanship, International (PATH INTL). Horses of Hope – Missouri, Inc. was developed in 2003 with help from the Missouri Department of Economic Development Neighborhood Assistance Tax Credit Program. Horses of Hope – Missouri, Inc. has received Missouri tax credits to establish programming and complete it’s new facility. 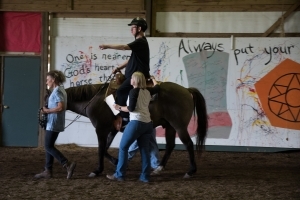 Both centers are not-for-profit 501c3 organizations dedicated to providing professional therapeutic, educational and recreational equestrian services to all populations. It is a volunteer driven organization that reaches over 1000 people annually. We provide equine-assisted therapeutic services in Southeast Kansas and the surrounding four-state area. We are proud to be affiliated with the North American Riding for the Handicapped Association (NARHA). The center includes a heated indoor riding arena and a comfortable room for families and community events. This facility is located on 19 beautiful acres in the foothills of the Ozarks. We are proudly affiliated with the Professional Association of Therapeutic Horsemanship, International (PATH INTL) and serve riders from Southern Missouri and Arkansas. The center includes a heated indoor riding arena and a comfortable room for families and community events.